Japan is the place in the world where everything goes fast and definitely furious. Fashion there is the expression of maximalism and the streets are full of colours with people wearing different styles. 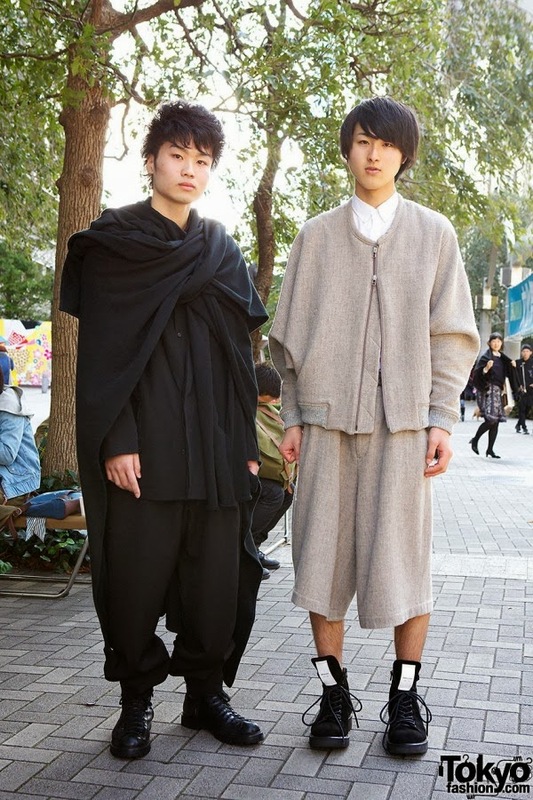 We are not self-important people and it will be dangerous to analyse Tokyo streets style in several pictures and sum up by trying to categorise people in tribes (these are the ninja Rick Owens....etc). Fashion tribes do exist in Japan, but we doubt European style has a real influence, considering the pictures below. Because people have been shot in Shinjuku, Harajuku or Shibuya, it does not mean they are an illustration of these neighborhoods. It will be stupid to simplify, because it is more complicated. 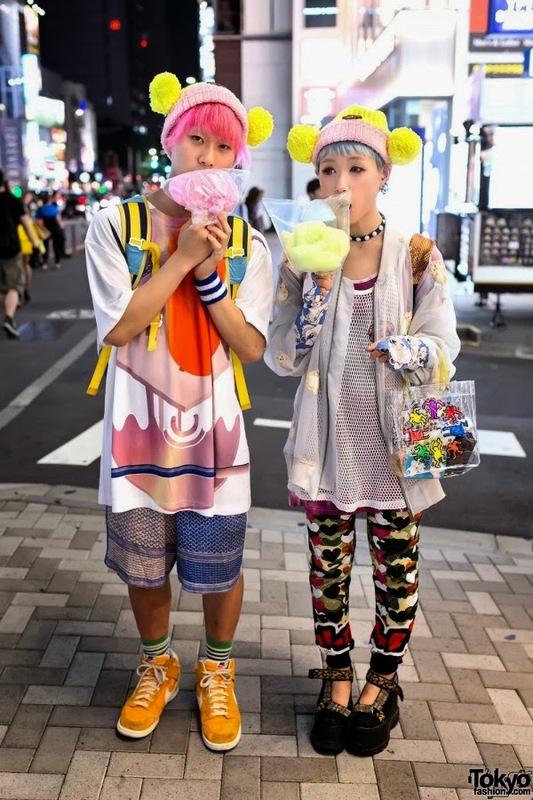 Tokyo has a great and unique streetstyle only because what is happening anywhere in the world does not affect them. It is probaly the only place in the world where the streets tend to be a bunch of fashion extremistas. You end up thinking: "these people are so crazy and it seems they are afraid of nothing in terms of styles!". It is actually the reason why Japanese brands are not looking to go overseas , because Europeans are not fashion extremistas. It is a shame , it is just a cultural stereotype. It is like saying that Japanese are crazy to dare wearing these garments. It is also like talking of the Japanese culture being composed of Manga and Kawai! 99%IS (pronouncing 99 percentis) is not about kawai, but about expressing extreme attitudes. 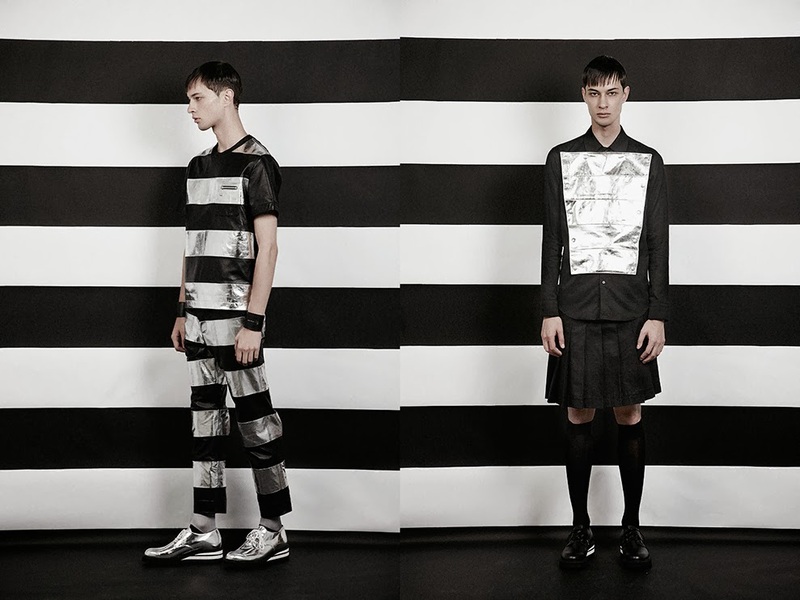 Bajowoo, a Seoul Born designer based in Tokyo, has a serious experience of punk in several cities (London, Paris, Tokyo and Bangkok), and that made him starting his own label in 2012. Bajowoo could have called his SS14 ubiquitous black or black tribulations. Black for Summer is a shocking colour and we are very far from the maximalism attitude of Tokyo streetstyle above. That's why there are no rules. Streets and fashion work together and wearing black is surely part of Tokyo streetstyles. 99%IS collection is an interpretation of how black can be worn. 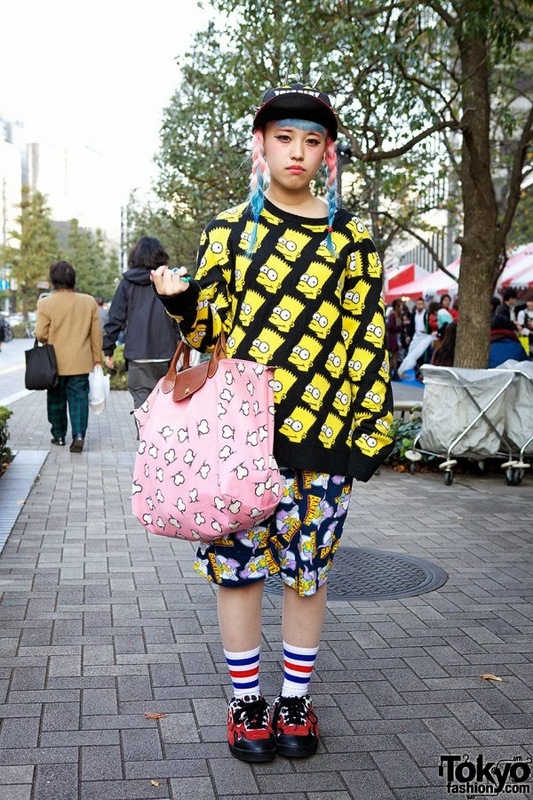 The collection is as extreme as Tokyo streetstyles are. 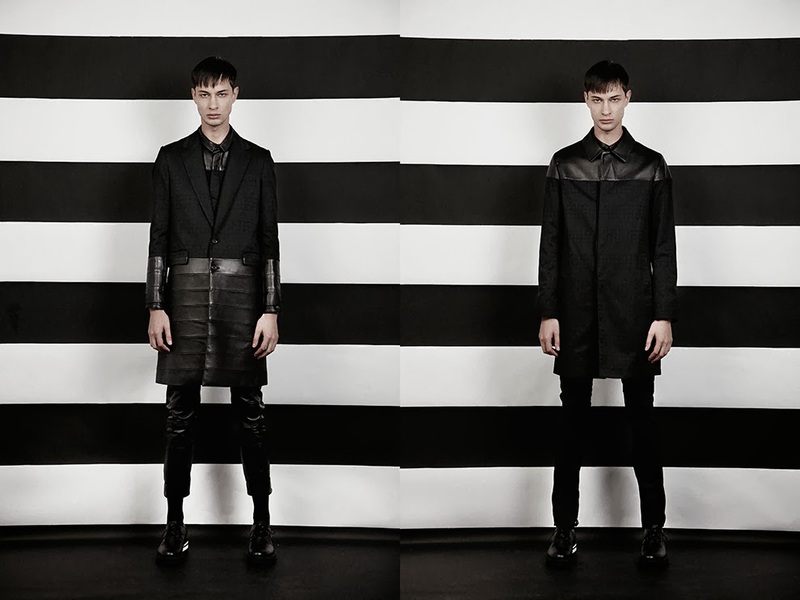 It is all about black in head to toe all-over looks. Black is more than a colour, but a statement. Silver and white stripes are to embellish and empower the black uniform, which is highly modern. The collection is very dark, but that is not what strikes the most. Actually the design of the garments gives a violent and agressive effect. Bajowoo plays with the graphic impact of his collection, as the stripes echoing with the set (the rectangular black and white striped structure). 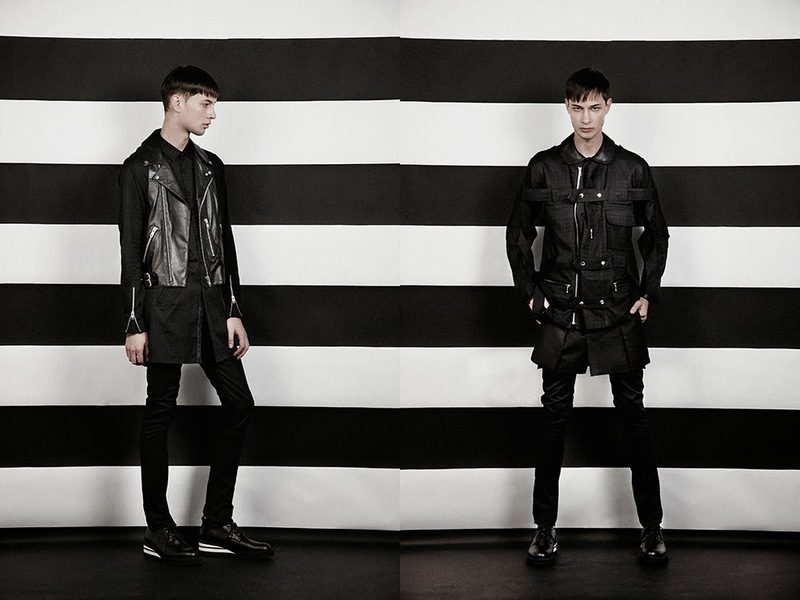 The inspiration for this collection is obviously punk, but there is another energy that is more pop and fun. 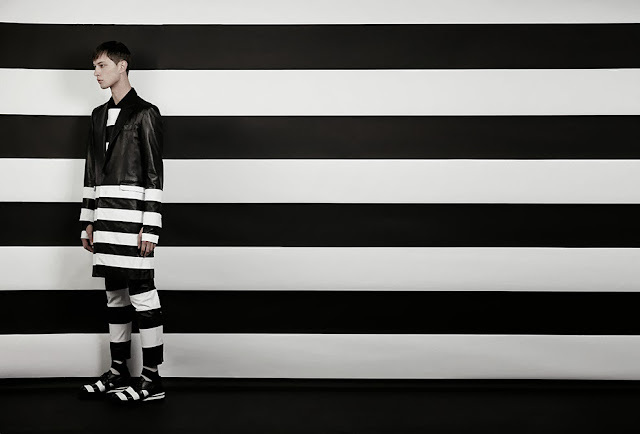 The striped oufits look like a costume and somehow we are never too far from the litteral clownish effect (black and white stripes remind us of Tim Burton's character BeetleJuice). Not really far from the fashion extremista hero of Tokyo famous fashion area. There is nothing really serious anymore in a way. Black is certainly a strong colour, but black is such a happy colour! Tokyo streetstyles pictures come from Tokyofashion.com and 99%IS lookbook pictures come from Faketokyo.com.